Poetry is a series of passes converted. Signs signifiers signified. He shoots he scores. Axons to dendrites: Sidnapses Crosbying an airwave to heaven. Meanings 'and in glove before we drop them. But materials are a game, also. A set of rules, relational paradigms which guide their formation and interaction. This abstracted diagram of the microscopic seems to be missing elements. Erasurefooted. Shouldn't there be more letters at the lines' junctures? The negative capability of science. What the fragmeant, making a fractured meaningchain out of a molecule. GB: Your notion of the polymeric plastic nature of culture—and of language—is fascinating. (Indeed, the title of this piece seems to be a kind of molecule, a kind of polymer.) You write about how plastic 'mimics' the natural—and here, your language appears to both mimic and create the world. Its iteration is a proof of concept. Could you extrude some thoughts about polymers, plastics, language, representation, form and structure? AD: Let me extrude: polymers are giant molecules made up of numerous repeating units. They exist, we might say, as both biological and synthetic plastics. I think of polymers as a form of writing. DNA, proteins, and carbohydrates, for example, constitute the chemical language with which living bodies are written. Similarly, polyester, polyethylene, and polystyrene constitute the material language with which we build our environments (clothing, food packaging, furniture, civic infrastructure). If polymers are a form of writing, then how might we identify them in the semiotic systems that already envelop us? When I started to look, I saw polymers all over the place in language and rhetoric (puns, polysyndeton, anagrams, anaphora) as well as in cultural formations (obsessions, anxieties, memes, fashions). I saw them in line-ups, in traffic, in the chains of logic that make up arguments. I saw them in the contagious fandom of spectator sports, and in the way our behaviour is disciplined in subtle and repeated ways by the persistence of stereotypes and reductive relationships with difference. My aim was to come up with a science/poetry project that would reveal what I call the cultural polymers or social plastics that predominate in Western petroleum culture. I want to think of plastic as not simply an unfortunate industrial decision, as bad policy, as a consequence of the pervasiveness of oil, but also as an expression of contingent polymeric formations essential to seemingly varied and reiterative human activities. What do cultural polymers look like? What are they made of? How might they help us understand our relationship with plastic differently? These were the sorts of questions I was interested in exploring. It was important that the compositional procedures and structures of the poems reflect the chain-like dynamics of polymers in different ways. I make use of anagrams, collage, all kinds of invented procedures (some more fanciful than others). 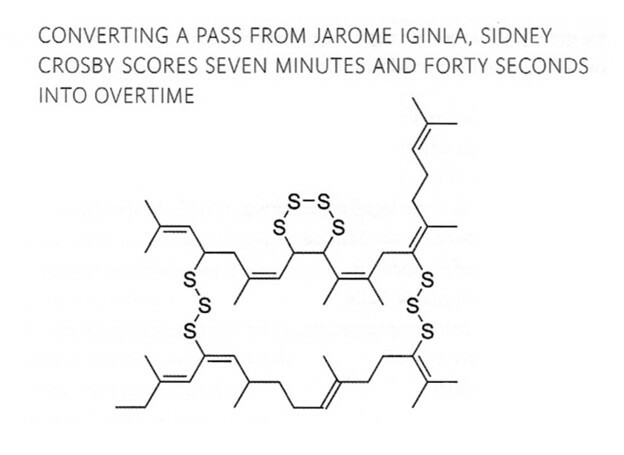 The visual poems in the first part of the book are an attempt to incorporate polymer writing (molecular diagrams) right into the book itself. In the last section of the book, the visual poems are imagined molecules that I created through some elaborate procedures. I wanted to see if I could find the repeating units that form of the basis of some significant cultural documents—texts that as a result their very controversy have been subjected to polymeric repetition through history. I chose Darwin’s The Origin of Species and the Canadian Charter of Rights and Freedoms as my examples. I manipulated the texts according to various sorting procedures (letter, word, sentence frequency and distribution) in order to determine these fundamental repeating units. From there I devised a method and worked with a chemist to produce a model of an imaginary but functional molecule. GB: In the visual poems in The Polymers, you title a number of illustrations of what I take to be molecule-related diagrams with surprising language drawn from polymer-like chains of reference. It's a delightful and witty juxtaposition/disjunction of types of language. The reader has to make an associative or interpretative leap in order to parse the pieces, in order to try to connect the words with the image. How do you imagining a reader 'reading' these visual poems? AD: I hope that any prospective reader will feel compelled to mess around with potential associations and alchemical solutions. I recognize that most people will have enough understanding of chemistry to know that each image is a molecule. Whether or not they understand the image to be a repeat unit within an oligomer or a longer polymer chain is another question. Nonetheless, I hope the polymeric context of the title is used as a point of reference for reading any dramatic or thematic links to the image. All the images are in fact real substances (outlined in the “Materials and Methods” section of the book). Therefore “reading” the poem with all of this in mind enacts a (polymer-like) chain of associations that I hope draws attention to the very materiality (and plasticity) of the act of associating (the self-conscious juxtaposition of seemingly disparate objects and contexts). The realization that the images refer to actual substances is not meant to be a solution to these poems but a frame of reference from which to jump into other associations with the title and the image. GB: These visual poems appear in the midst of (mostly) purely verbal texts. How do you see this relationship between different types of texts and different kinds of reading? AD: The idea of “different kinds of reading” was very important to me with this book. Part of my research involved immersing myself in polymeric situations in order to “read” objects or circumstances, to hear what they had to say, to treat seemingly none expressive phenomena and situations as forms of media. For example, I spent a great deal of time studying line-ups. During one memorable occasion I spent an entire day circulating through the line-up for the “Maid of the Mist” tourist boat in Niagara Falls. I would put on the plastic blue rain-slicker just like everyone else; but, instead of getting on the boat, at the last minute I would duck out and circulate back to the beginning of the line. The whole time I was recording what people were talking about, listening to the line-up expressing itself, reading its excitement and fatigue as the day wore on. The tour boat attendants were initially suspicious of what I was doing, but after I explained it to them they started to regale me with fascinating stories about past line-ups, about the antics of people waiting. Reading polymers in culture required me to think of literacy and literature differently. Conventional reading, it seems to me, is a polymeric activity that involves encountering a chain of text that goes on and on in a way that formally, structurally barely registers (except at the ends of pages or at the breaks in words). On the one hand, I wanted to exploit this polymeric instinct in reading by including a number of prose poems and poems presented as fully justified, molecular blocks of text. The visual poems, conversely, are in the book to counteract the complacency that comes with this kind of reading. How do you read these images? Perhaps in some of the ways I have suggested above. The materiality of reading becomes evident when it is defamiliarized and deterritorialized into other generative forms like chemistry. Adam Dickinson's poems have appeared in literary journals and anthologies in Canada and internationally. His collection, Kingdom, Phylum was a finalist for Ontario's Trillium Book Award for Poetry. He teaches poetry and poetics at Brock University in St. Catharines, Ontario. The Polymers (House of Anansi) was published in Fall 2013.